Plot Summary: The 31st century. Ulysses is the Captain of the spaceship Odysseus, directed by the central computer Shyrka. As a a gift for his son's Telemaque's 12th birthday, Ulysses takes him on a space journey for the first time. Telemaque is kidnapped by aliens who need a child sacrifice to their god - a giant cyclope, who is discovered to be a machine, of which the aliens, of course, are not aware. Ulysses saves his son, along with a little girl, Themis, and her older brother. As a punishment for such an intervention, the Great Gods of the mysterious Olympus punish him, freezing all Ulysses's staff, leaving him alone on the ship with Telemaque and Themis. The way back to Earth is erased from Shyrka's memory. Now Ulysses has to find the Kingdom of Hades in order to discover the way home. Ulysses's journey and adventures are parallelled to those of his ancestor, the Ancient Greek Ulysses, though "translated" into the Outer Space. The question of who actually the Olympus Gods are is raised. 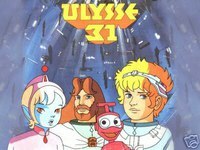 A Franco-Japanese co-production, Ulysses 31 is a space opera adaptation of the Odyssey, the 8th century Greek poem by Homer about the mythology of Odysseus (known as Ulysses in the Latin version). It was first aired in France in 1981. King Record sold it in OAV format in 1986, before Nagoya Broadcasting Network brought it on air in 1988. The rerun of NHK BS2 in 1991 was re-dubbed with a completely different cast.